I was thinking of what to cook for lunch yesterday. Roti again? I was wondering how I can prepare roti differently. Then remembered 'Roti mela'. Wow! how many varieties of roti till now...amazing..thanks Srivalli for conducting such a useful and fun event. So here is my onion roti. 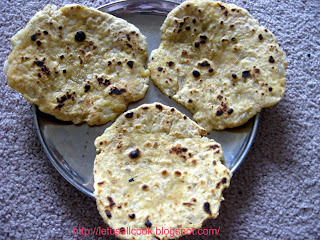 A simple variation from the normal roti preparation. I found it very tasty and this goes to Srivalli's Roti Mela. In a bowl, mix all the ingredients. Add water little by little and knead the dough. This is same as that of a normal roti preparation. Now, as usual take a small round ball of dough, roll it to whatever shape you want and cook it on both sides with the help of Tawa/griddle. Serve hot with side dish of your kind. Nice variation with the onion roti. first time to ur blog.. I make these chapathis when I get bored with usual ones. Nice recipe.